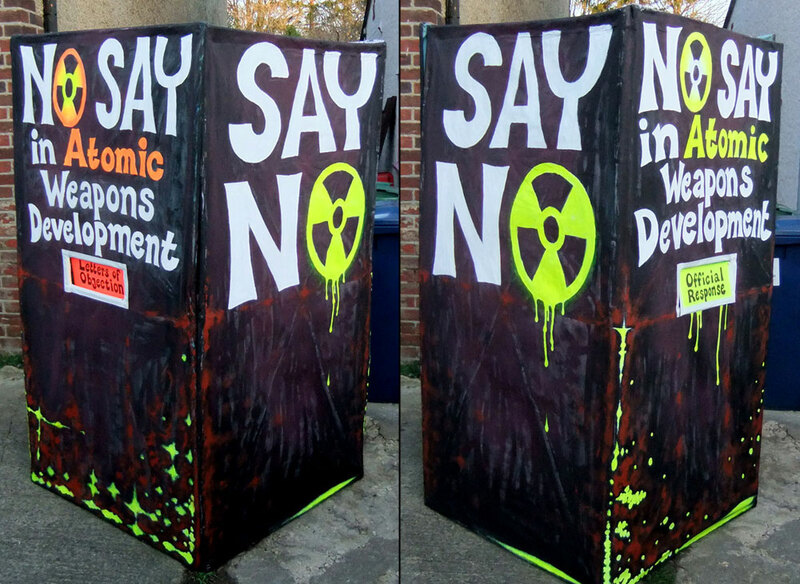 Occasionally I get asked to make 3D objects that are used in protests and stunts. We made this giant toy windmill and took it to Tandem Festival. Here is a short 3min video of us building it, climbing all over it, and taking photos from the top of it, plus a few photos of some of the many great events and people at the festival. Tandem Festival ran from 19 – 21 June 2014 at HillEnd Farm, near Oxford. The festival was run by volunteers and combined (mostly) acoustic music, sustainability, art, crafts, bikes and bike-trailers, veggie food and a lot of fun! See: tandemfestival.com This windmill was made out of three scaff poles, some old scrap sheets and a bike wheel, plus a variety of clever attachments – we need more attachment in the world! who will soon use them in a campaign against militarism. I used old cardboard boxes to make the bulk of the body. 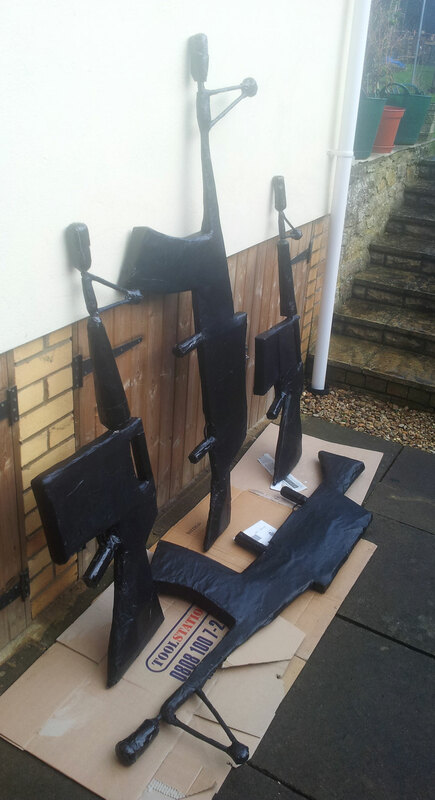 final coat of black acrylic. 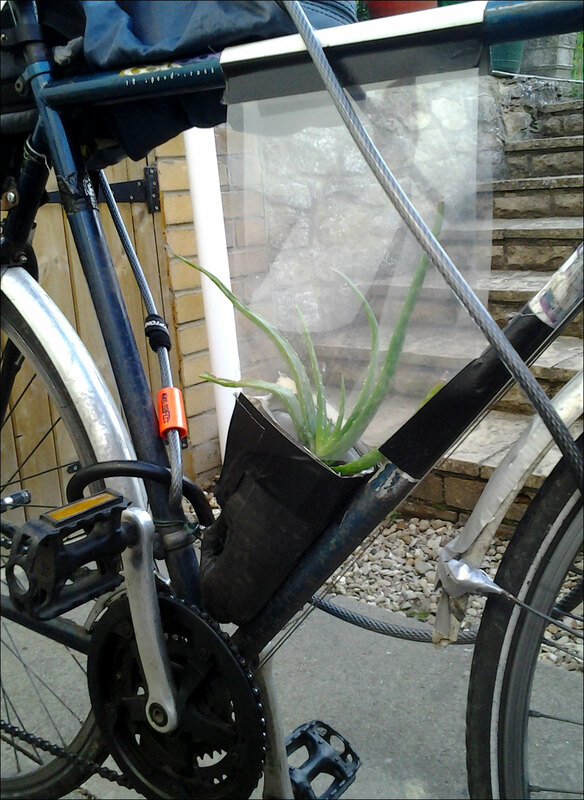 Here is a photo of the aloe vera plant growing in a small container on my bicycle. It’s been there for a few months and it seems quite happy there. I am about to remove it as the weather here in Oxford has just got a lot colder. Aloe Vera does not like the cold. The sap from this plant is a very useful ointment to alleviate the pain from cuts, and grazes, so this mini-greenhouse is also a mobile first aid kit. Last year I planted a tayberry in this bike-pot, my favourite berry, which is a cross between a raspberry and a blackberry. But it did not live for long. I neglected it. The small pot runs dry quite soon. Aloe vera does not mind getting dried out in between watering. This plant is protected from the winds by two thin sheets of clear plastic attached to the bike frame with gaffer tape. The plant’s pot is made from an upturned plastic milk carton, filled with some pebbles for drainage and soil and compost from my wormery. The screw-cap of the milk-carton has a few small drain holes. One side of the pot is coated with black gaffer (as shown) while the other is coated with white gaffer. This allows me to choose how hot it can get when I have to leave my bike in a sunny spot. I am reminded of the wonderful tunes of the Formidable Vegetable Sound System who is currently on a tour to promote his debut album of permaculture-related songs. He calls his tour the “GROW FOOD EVERYWHERE TOUR”. 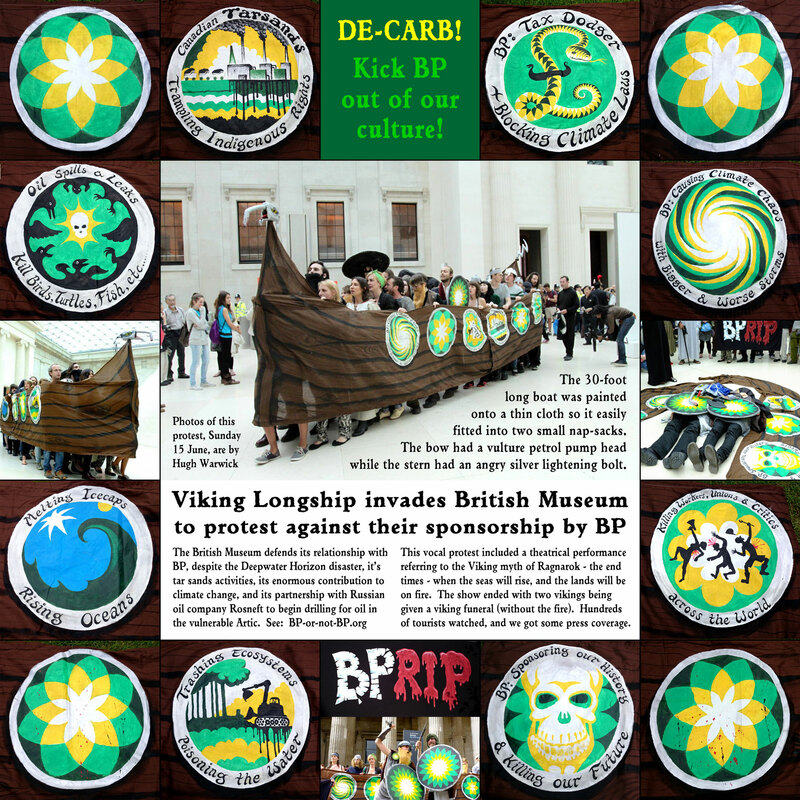 A folding card ‘ruff’ that is also very similar to the crass ‘floret’ logo for BP (British Petroleum) made of card in 2012. 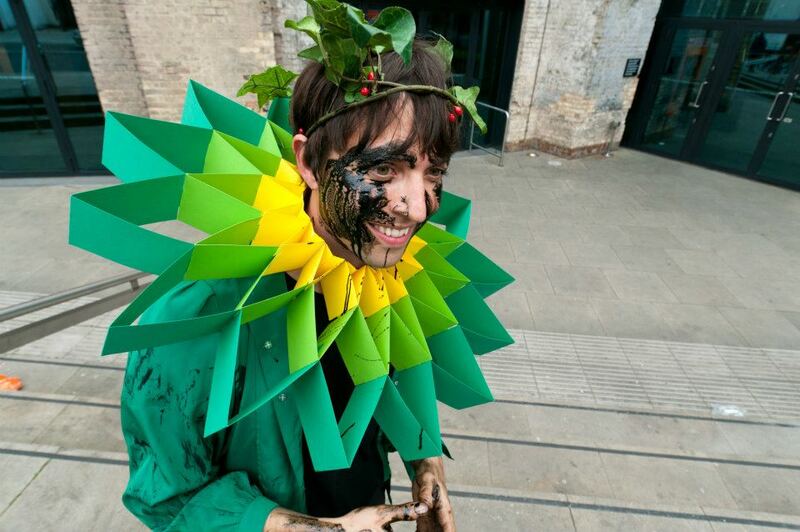 This prop folds flat to fit in a pocket, and was used several times the Reclaim Shakespeare Company, a troupe of anarcho-thespians who jump up on stage before BP-sponsored Shakespeare performances to perform their own Bard-inspired pieces about the perils of taking money from BP. 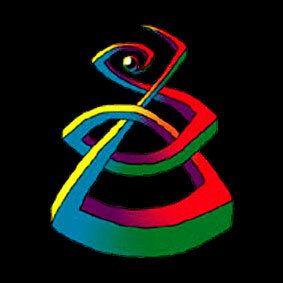 Visit their website for some great videos, useful info and links, and many witty puns! 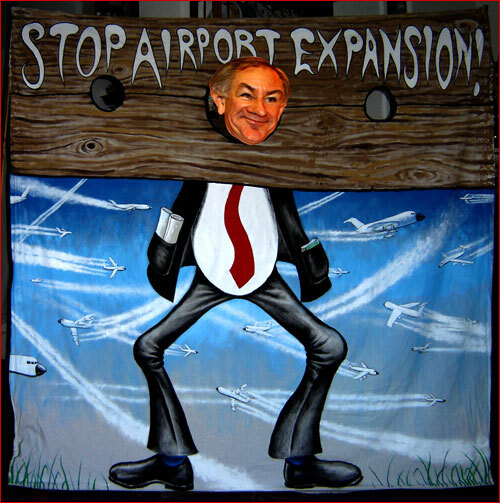 This very simple ‘stocks’ props was made in 2009 for the Airport Watch campaign that was joining with several other groups to oppose the proposed third runway at Heathrow Airport just outside London. It was really just a banner with three holes cut into it, hung off a very simple bamboo A-frame, so it was very light and portable – easy to transport and set up quickly. 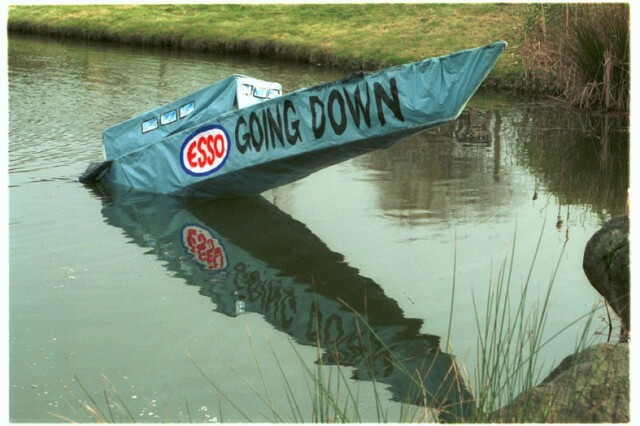 It was used at several ‘flash-mob’ events both in London and at Heathrow and made fun of the Transport Minister Geoff Hoon. In medival times a set of wooden stocks were sometimes used to lock up a thief or other criminal in the town square, where villages were able to throw rotten vegetables at. 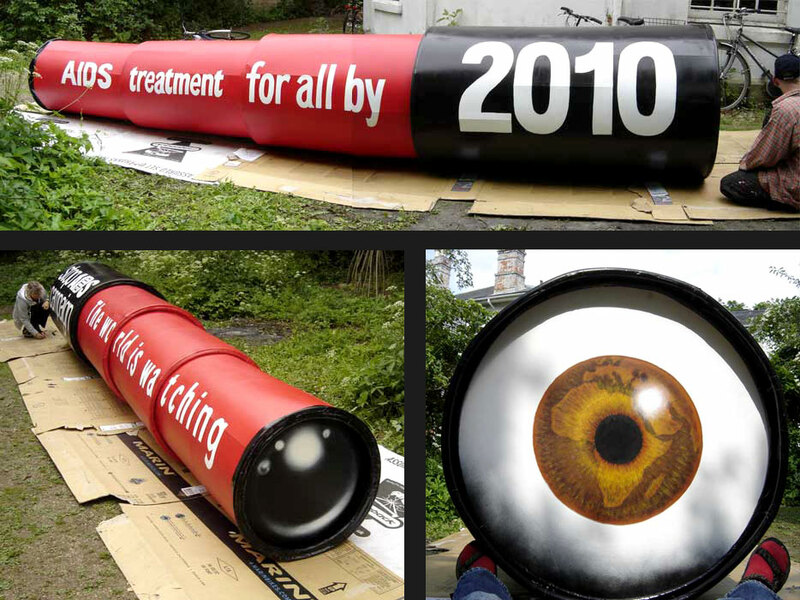 These two props were made for Transport 2000 (who are now called Campaign for Better Transport) in 2009. 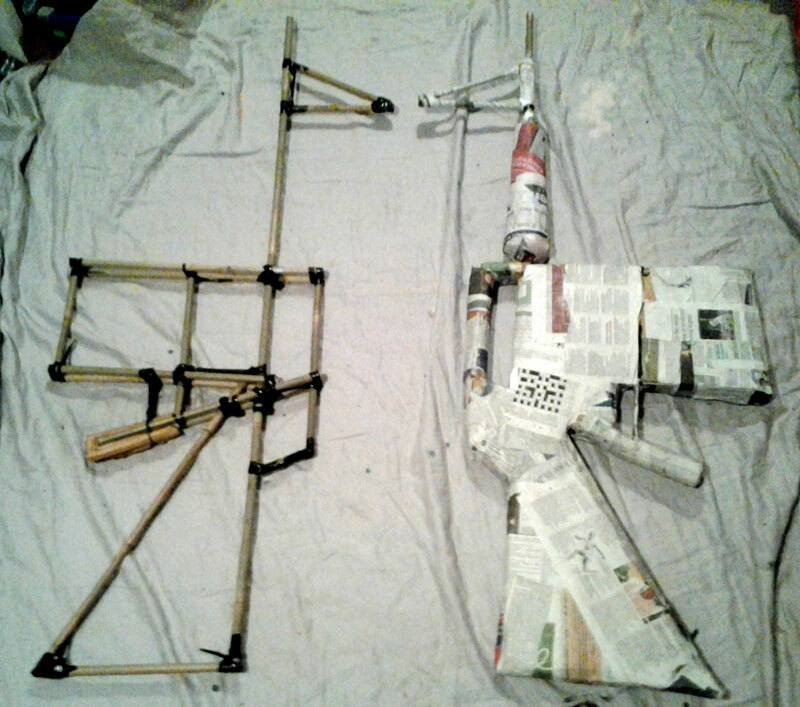 They are made of a light-weight bamboo skeleton covered in a papier-mache skin, like with many of the props I make. They are small enough to fit in a taxi but large enough to be eye-catching. 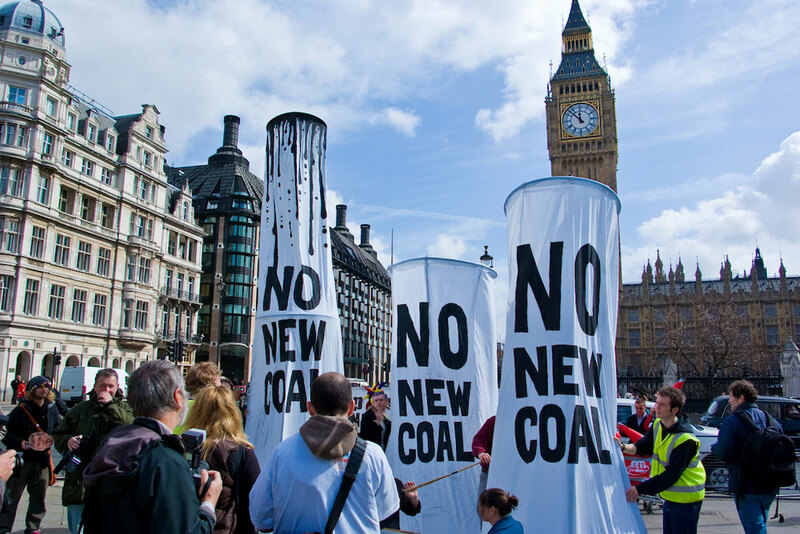 This summer (2013) the folks at People and Planet are teaming up with Bill McKibbon’s 350.org and Operation Noah to run a fossil-fuels-free UK tour, bring Bill’s “Do the Math” message to UK student. This is great news and I hope this really inspires thousands of new people to get active on saving our climate. 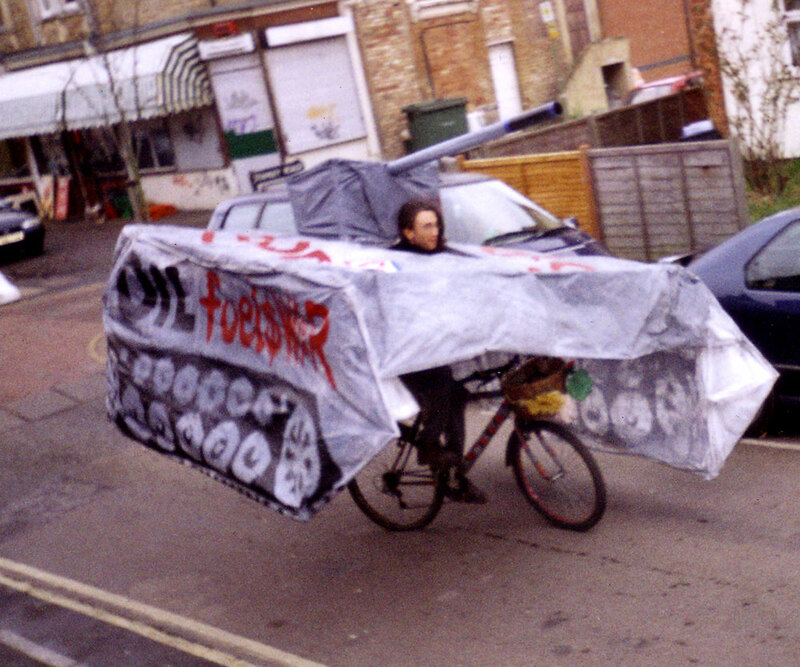 The tank was so light and portable that you could even cycle a bike while wearing it, as shown in the photo below. 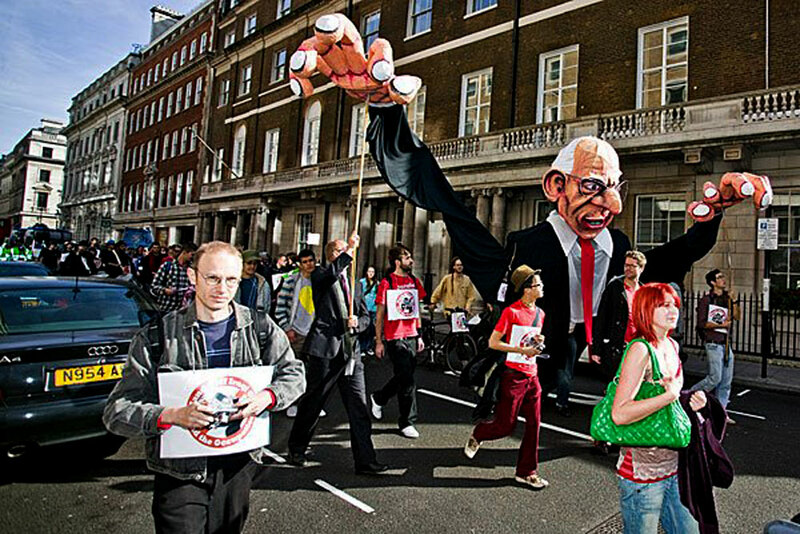 Later in the year there were many large anti-war protests in Oxford, and at one such event a large group of students decided to peacefully blockade a major road in Oxford. Many costumes, banners and placards were in the crowd, along with music and chanting. 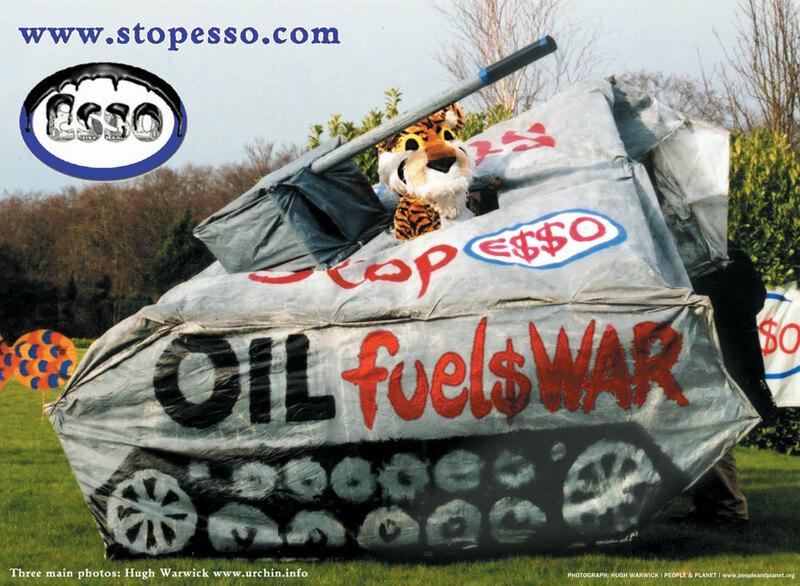 This tank was also there reminding folks that oil was a major factor in the war. Apparently the police charged the students quite violently and two large cops were seen to tear apart his prop. I wish someone had captured that act on film – it would have been a great symbol of our times. 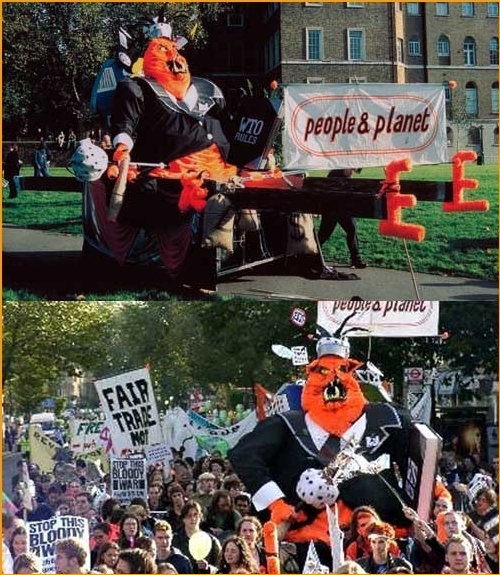 A giant costume and carnival float from 2001 of a fat cat. This prop was the first BIG prop I ever made and it has its own page of photos, here.